William Gilbert, poet, theosophist and astrologer, published The Hurricane: A Theosophical and Western Eclogue in Bristol in 1796, while he was on intimate terms with key members of Bristol literary culture: Coleridge published an extract from The Hurricane in his radical periodical The Watchman; Robert Southey wrote of the poem’s ‘passages of exquisite Beauty’; and William Wordsworth praised and quoted a long passage from Gilbert’s poem in The Excursion. The Hurricane is a copiously annotated 450 line blank verse visionary poem set on the island of Antigua where, in 1763, Gilbert was born into a slave-owning Methodist family. The poem can be grouped with other apocalyptic poems of the 1790s—Blake’s Continental Prophecies, Coleridge's Religious Musings, Southey's Joan of Arc—all of which gave a spiritual interpretation to the dramatic political upheavals of their time. 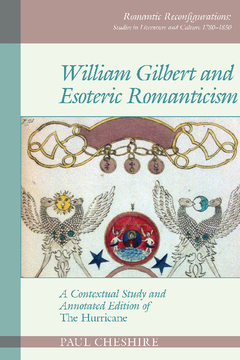 William Gilbert and Esoteric Romanticism presents the untold story of Gilbert’s progress from the radical occultist circles of 1790s London to his engagement with the first generation Romantics in Bristol. At the heart of the book is the first modern edition of The Hurricane, fully annotated to reveal the esoteric metaphysics at its core, followed by close interpretative analysis of this strange elusive poem. Paul Cheshire has written a number of articles on Coleridge and his contemporaries, including a chapter on Coleridge’s notebooks for the Oxford Handbook of S T Coleridge. He has also written on the influence of seventeenth-century hermetic philosophy on Milton. His initial study of The Hurricane ‘The Hermetic Geography of William Gilbert’, appeared in Romanticism in 2003. Paul Cheshire has written a number of articles on Coleridge and his contemporaries, including a chapter on Coleridge’s notebooks for the 'Oxford Handbook of S. T. Coleridge'. He has also written on the influence of seventeenth century hermetic philosophy on Milton. His initial study of 'The Hurricane', ‘The Hermetic Geography of William Gilbert’, appeared in Romanticism in 2003. The Hurricane: a Theosophical and Western Eclogue. To which is subjoined, A Solitary Effusion in a Summer’s Evening.